Have you ever wondered why the 2012 FD Champion, Daigo Saito, can't be seen drifting his Achilles Radial Lexus SC430 at the moment? 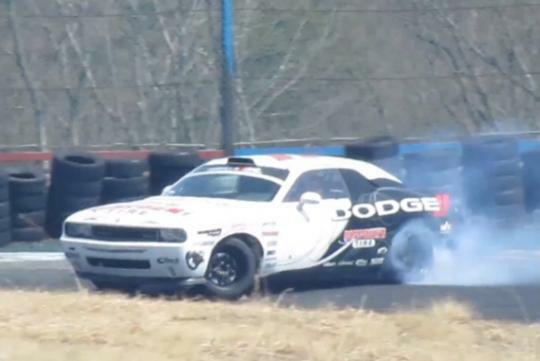 Well, it's because this professional Japanese drifter is currently busy with this Dodge Challenger, a muscle car from the country of Uncle Sam, at the Ebisu Circuit. But if you think this is just a normal American muscle car, well, think again. The said Dodge Challenger � which actually belongs to Samuel Hubinette - carries a total power output close to 900bhp, from a HEMI engine with a displacement capacity of 6,700cc. Unfortunately for Saito, he won't get too many chances to get behind the wheel of this monstrous Challenger. Thus you might not get any other video than this - so, enjoy it while it lasts. After all, it's been a common thing to see Japanese and European cars drift, yet it's a whole different story for an American muscle. For your information, Samuel Hubinette, used to take part in the Formula Drift championships in the United States - piloting this particular Dodge Challenger.